Sisto Joseph Averno was born May 25, 1925 in Paterson. A tough, strapping athlete with good speed and strength, he made a name for himself on the gridiron for Paterson High School. Sisto turned down college scholarships to joined in the Navy at 17, doctoring his birth certificate in order to enlost. He saw action in the South Pacific during World War II as part of a destroyer gunnery team. Upon his return, Sisto was informed that two of his scholarship offers were still on the table. He picked College in Pennsylvania over the University of Maryland, and continued his football career while majoring majored in philosophy. 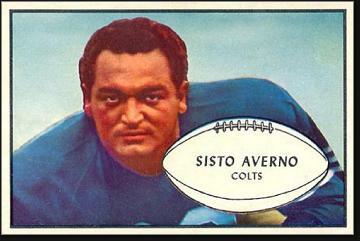 After graduating in1950, Sisto went undrafted by the pros, but made the Baltimore Colts—one of the AAFC teams invited to join the league that year—as a walk-on. The Colts had some talent on the roster, including Y.A. Tittle, Jim Spavital, Billy Stone, Herb Rich, Chet Mutryn, Don Colo and Art Donovan, Sisto’s roommate and running buddy. However, the season was a disaster. Baltimore went 1–11 and gave up 462 points—including 70 points to the Rams in an October game. The trip wasn't a total loss. Sisto and Artie destroyed a suite at the Beverly Wilshire hotel, and flooded the two floors below them. Sisto played middle guard on defense that year and was a terror on special teams. He also got married that fall, and didn’t tell anyone on the team. Donovan found out and the players gave him hell him the rest of the season. The Colts disbanded after the 1950 campaign and the NFL made the Baltimore players part of the 1951 college draft. Tittle, Spavital, Stone and Mutryn all went in the first round. Although he already had a season under his belt, Sisto was the last player chosen, by the Cleveland Browns. Donovan also taken by Clevelnand. Sisto and Artie had zero chance of making the powerhouse Browns. Head coach Paul Brown called them into his office to give them the bad news, but also let them know he had traded them to the New York Yanks so they could play close to home. Brown was likely reluctant to let the two second-year pros hang around camp and learn his defense, only to take it to their next stop. For the brief time they were Browns, the pair were treated like human tackling dummies. As fate would have it, the Yanks also managed only one victory before going out of business. The franchise was transferred to Dallas for the 1952 season, and Sisto became a Texan. This team was just as bad as the previous two, finishing with a lone victory before going belly-up. Sisto landed back in Baltimore in 1953 with the reconstituted Baltimore Colts. He played guard and middle linebacker and rarely came off the field. The Colts started well with a 3–2 record, but lost their final 7 games. The Baltimore defense included Donovan, Bill Pellington, Bert Rechichar and Don Shula. This version of the Colts would soon become a title contender, but Sisto was pushing 30 by this time and dealing with years worth of wear and tear. The 1954 season would be his last in the NFL. He appeared in three games before calling it a career. Sisto’s ironman reputation made him a favorite of Colts fans, and he was a regular at fan events and team reunions. Always a likeable guy, he was a natural salesman and made a good living in the Baltimore area working in Chevrolet showrooms. In his 70s, Sisto began dealing with medical issues related to his playing days. He became an important voice in demanding that the NFL step up and provide more assistance to the players who helped build the league. He passed away at age 86 in 2012.